I wasn't the biggest fan of "Suicide Squad" but I did like the costumes. 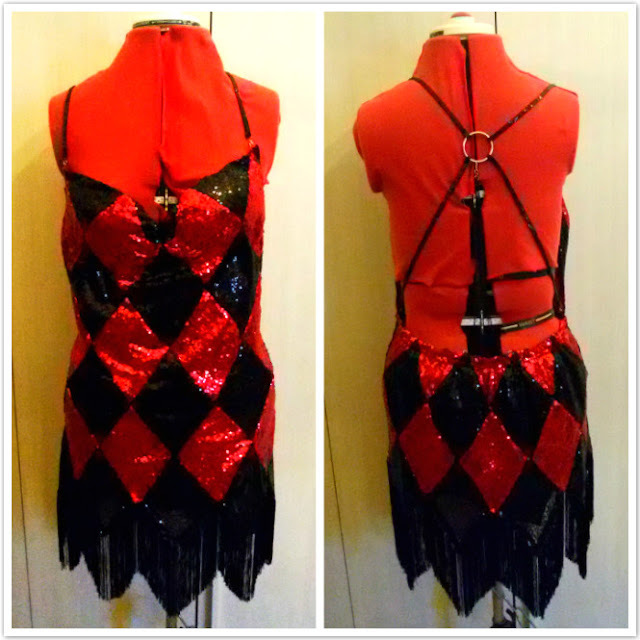 I already made Harley's main outfit, but I also like this dress she wears in a flashback scene. The original dress is made of metal mesh, with a black and gold diamond pattern. Although I quite liked this design, I wanted to try something a little different. 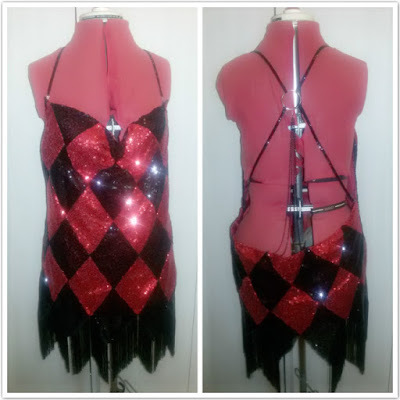 I decided to make a dress based on this one, but in red and black. Here's the design I drew up. 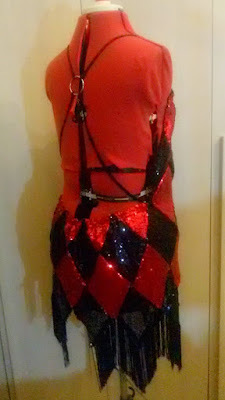 I looked at a LOT of tutorials to make this dress, and I'll provide links to them here, as they were incredibly useful. 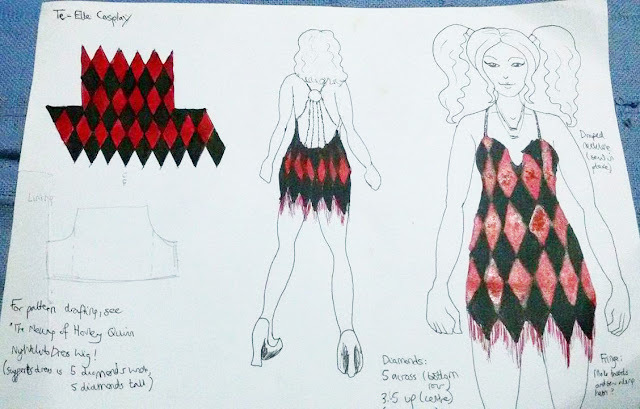 I followed TEoELLE and Arlena Fae's advice for drafting a pattern. 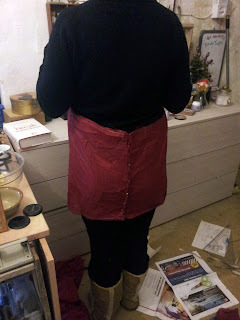 I took the measurement of the widest part of my hips, the bust measurement (with allowance for the fabric to drape), and the distance from top edge to bottom edge of the dress on the back and front. 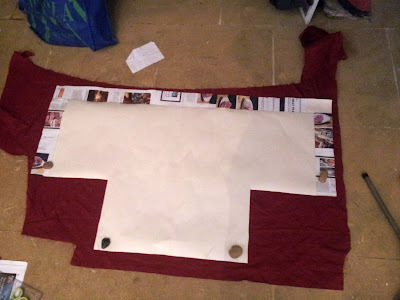 I used lining fabric to make this mockup: I eventually used it to line the real dress. I checked the fit on myself and my dress form. 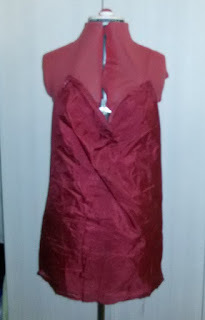 The dress form was useful for playing around with the draping, but trying it on gave me a better idea of the actual fit and whether I could move in it. Then I had to cut out the diamonds. A LOT of diamonds. I had half a yard each of black and red sequin material, which was just enough for all these diamonds. WARNING: be careful which grain you cut on. 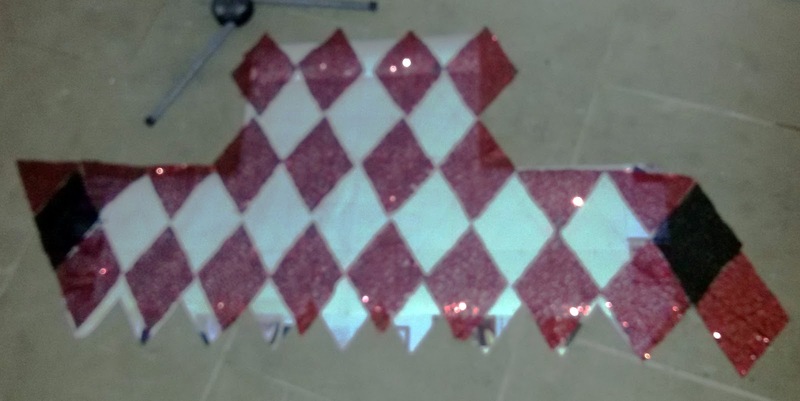 I cut my diamonds on the wrong grain, and the dress shrank when I sewed them all together. It fit fine width-wise, but was much too short. 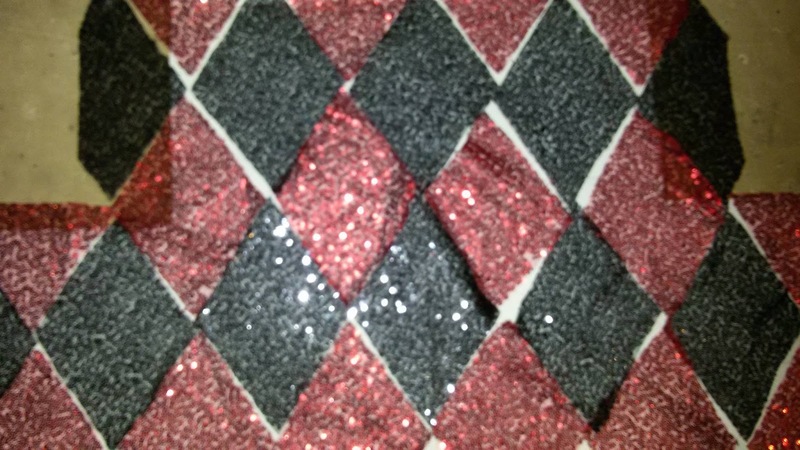 I was able to solve this by adding another row of black diamonds at the bottom, but it was a little annoying. Once all the diamonds were cut out, I sewed them together in diagonal strips: Arlena Fae and TEoELLE demonstrate this in their tutorials. Then I sewed all the strips together. 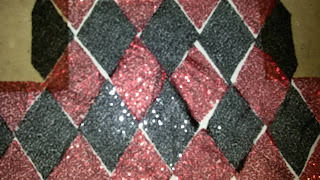 When I realised that my dress was too short, it was a bit difficult to sew on the extra black diamonds neatly. I have areas where the diamonds don't line up perfectly, but I have some spare sequins which I can sew on to disguise this. Here's the dress with an extra row of black diamonds. I pinned on some black fringe to see how it would look. 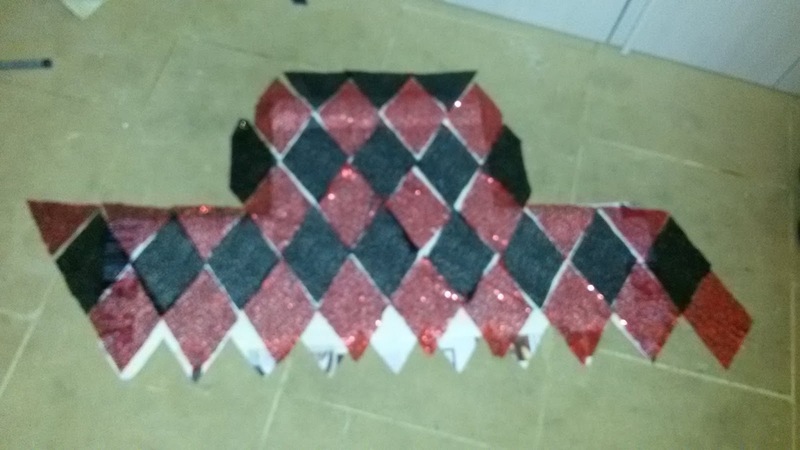 Some cosplayers just use sequin material and cut it into strips, but I don't think my material would hold up to this. It would probably shed sequins all over the place. I bought 2m of fringe, but perhaps I should have bought more. 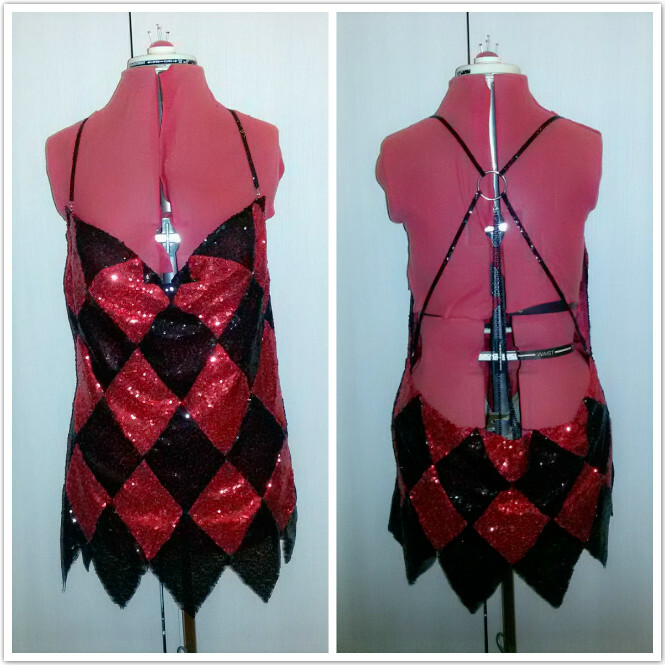 So unfortunatley I forgot to take pictures when I was making the straps, but I can easily describe the process. 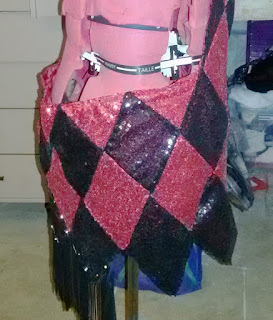 I bought some thin black elastic and black sequins, measured the straps to the correct length, then sewed on the sequins by hand. This took a while. 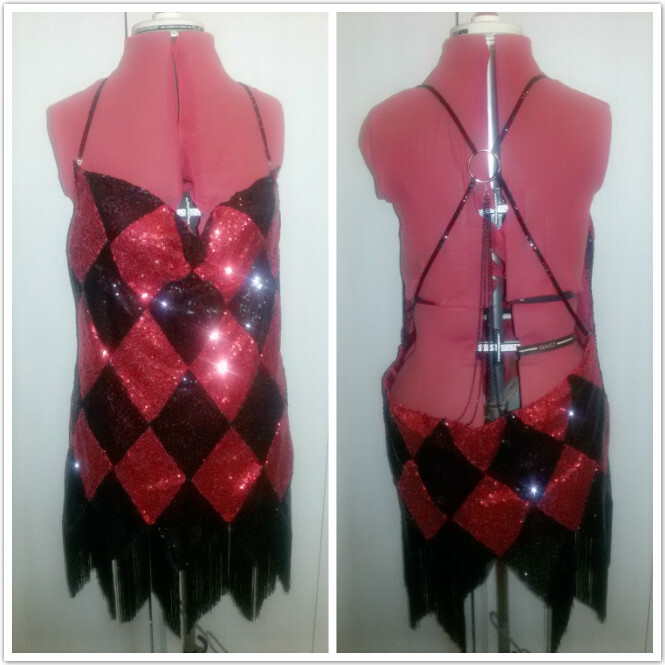 I had to keep adjusting the straps' length, so I wish I had waited until later to sew on the sequins. Once the straps fitted well, I sewed on jump rings to both the dress and straps, and attached lobster clasps. The other end of the strap was sewn to the metal ring. The metal ring is a curtain ring, as I couldn't find a metal ring in the right size. For the chain, I cut pieces of black chain to the correct length. The pieces near the middle are a little shorter, while the pieces on the outside are a bit longer. The chains are attached to the ring with jump rings, and to the dress also with jump rings (the rings are held in place with elastic). 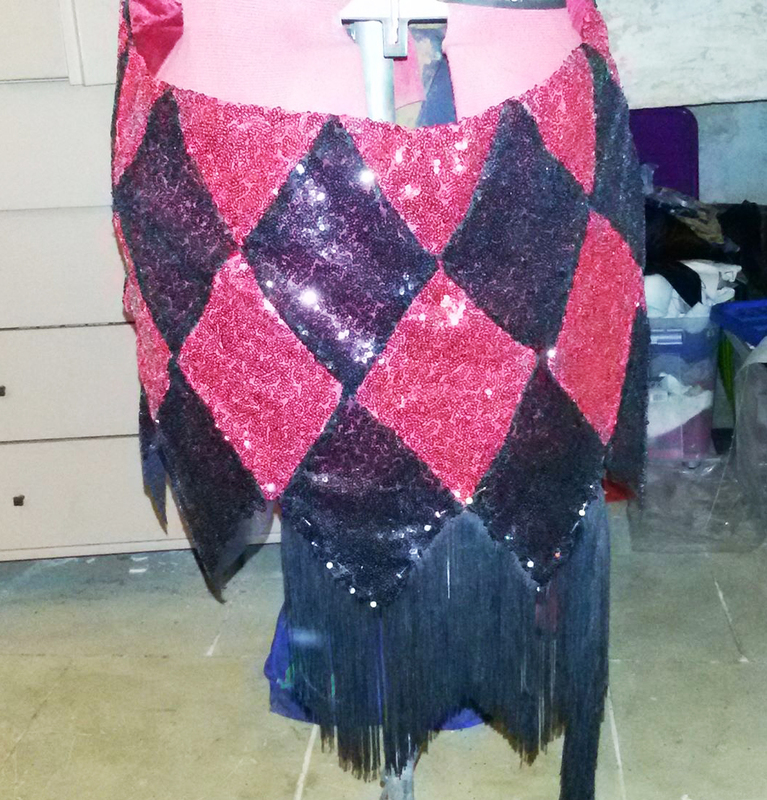 I have seen versions of this dress where the makers used sequin material to make the fringe. I didn't want to deal with loose sequins falling off the dress (my room is already covered with sequins from cutting out this dress; every time I think I've cleaned them up I find ten more). 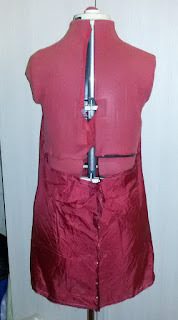 To sew the fringe on, I turned up the hem and pinned it in place. There were a few bald spots in the fringe. To fix this, I cut small pieces of fringe and glued them in place with fabric glue (I will sew them in place later). This type of fringe is annoying as it tries to unravel very quickly. 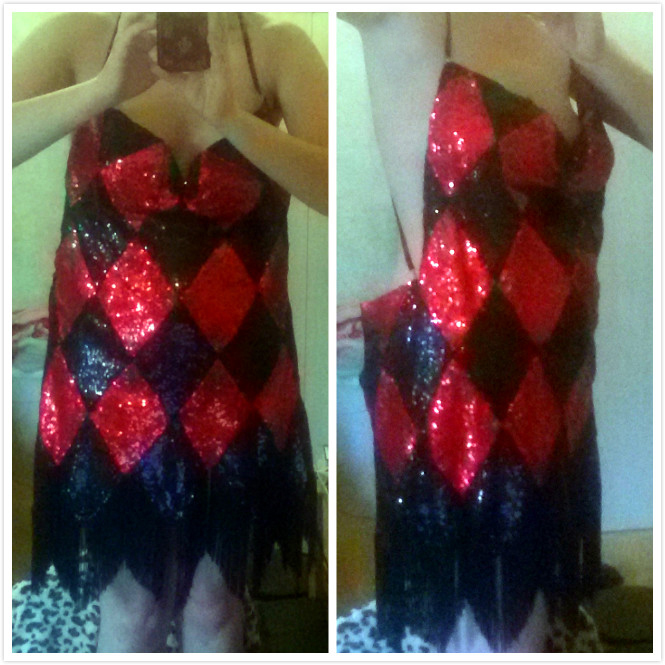 The dress was very loose at the back, as you can see in the pictures. 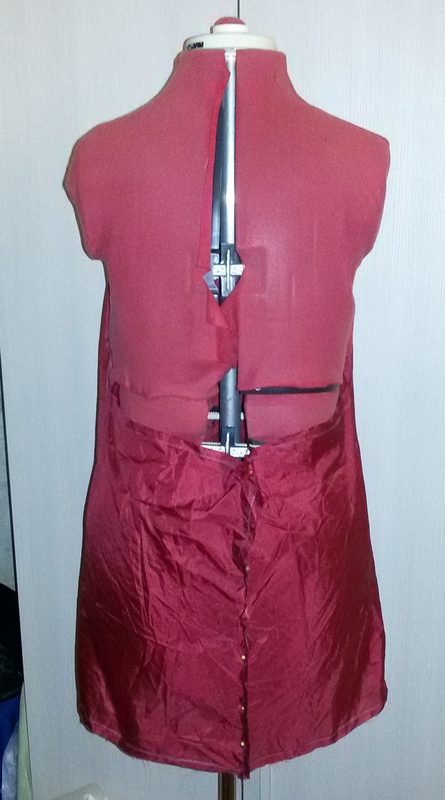 To improve the fit, I took a piece of elastic and pinned each end to the side seam on the inside of the dress. 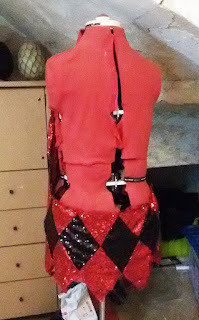 I stretched the elastic as I sewed it on (using a zigzag stitch), clipped the loose threads, and used a permanent marker to colour in the red thread that was visible on the black diamonds. This improved the fit drastically. 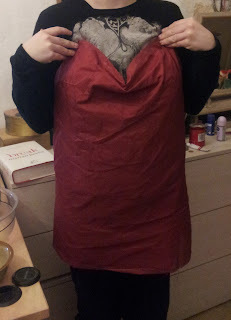 I also sewed bra cups into the front of the dress. 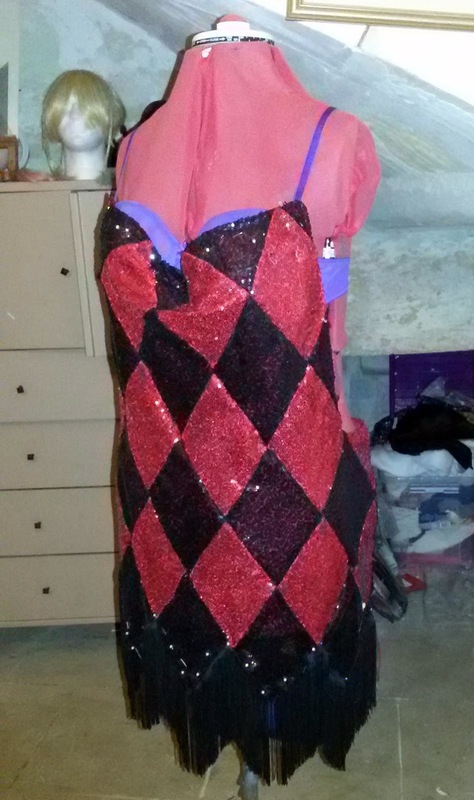 I cut them off an old bra and pinned them in place while the dress was on the mannequin. I then hand-sewed them on to the dress. For now I think that the dress is complete. 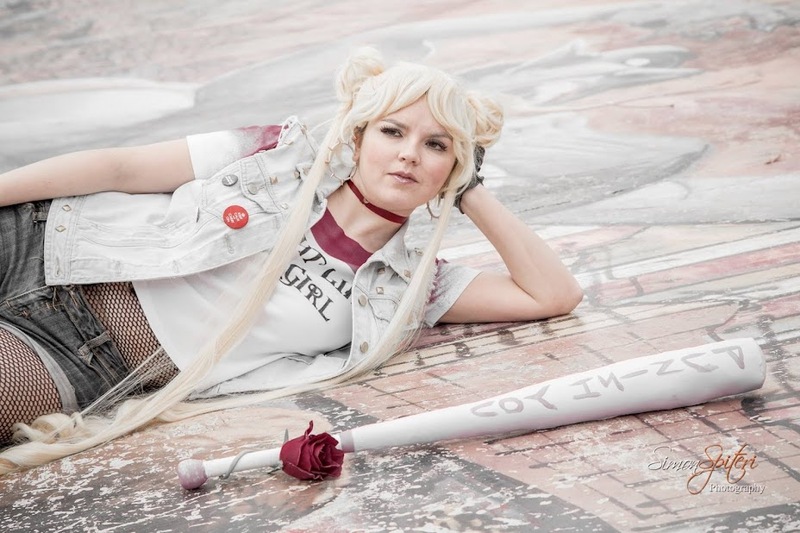 I still need to make some accessories, such as a gun, a wig, and a small handbag to carry my things while I'm at conventions. 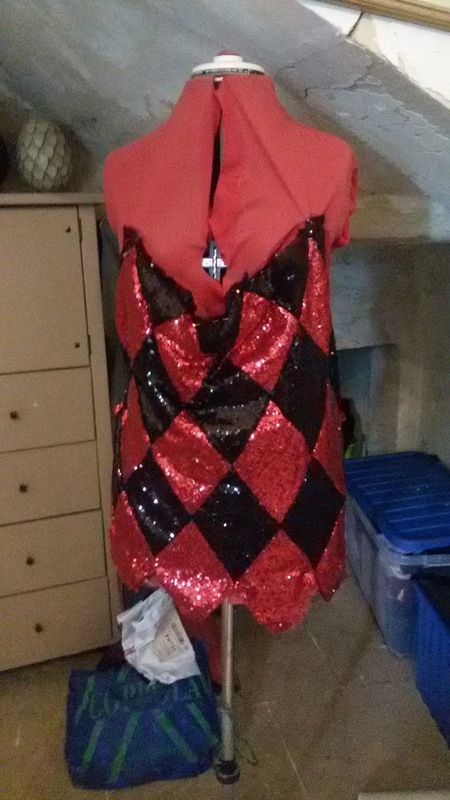 I'm hoping to wear this to the summer edition of Malta Comic Con 2018.